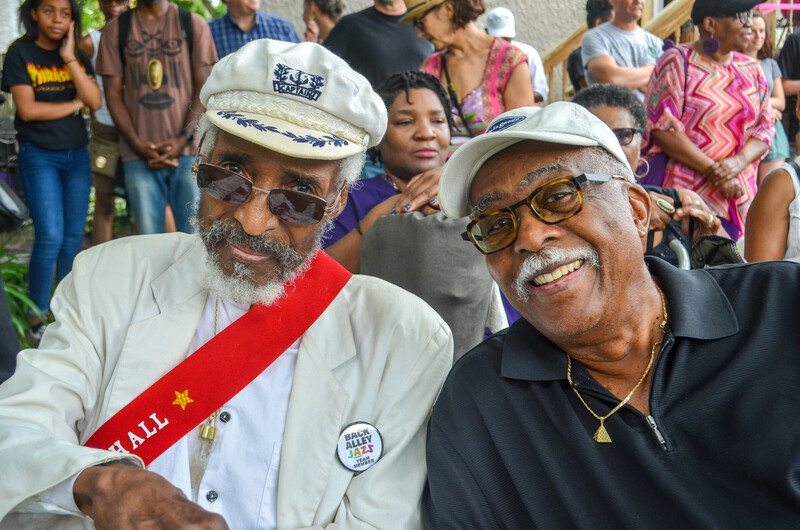 Ellis and alley jazz go back a long way: the tradition began as a record-listening session in the three-car garage of Arthur “Pops” Simpson on 50th and South Champlain, but Ellis was the first to bring live music to the party. He’s since made a career in live music: though the first record under his name appeared just two years ago, when he was eighty-five, he’s had a reputation as a master player for decades. 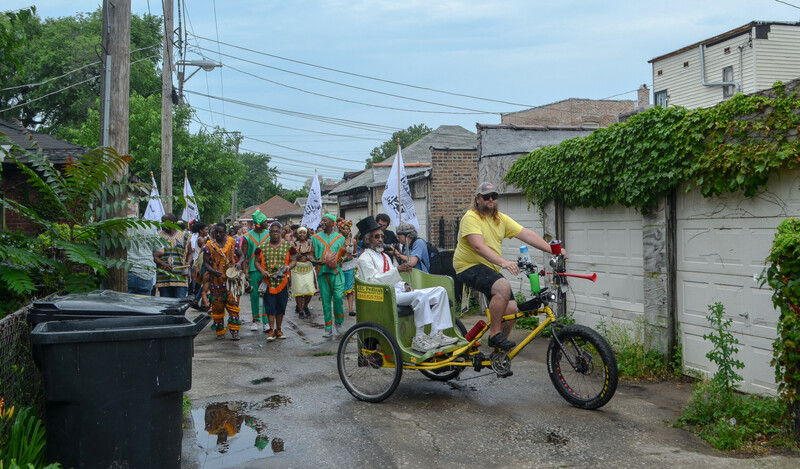 So it was fitting that he be the “Grand Marshall” of Back Alley Jazz, which was intended to bring live music back to the South Shore community. Beside the tables were a make-your-own poster stand and an open tent filled with dozens of photographs—black and white and in color, framed and on posterboard— of performances from the seventies to today. Many were taken by Mr. Ellis himself. The photos weren’t up for sale (nothing was): they were there to give the festival a sense of the heritage it belongs to. This focus continued into the backyard performances. The first performance of the day was a bomba set in the backyard of 7330 by a group called Bomba Con Buya. Four drummers laid down the beat, while the singer told the audience that bomba music can only exist in a community context. 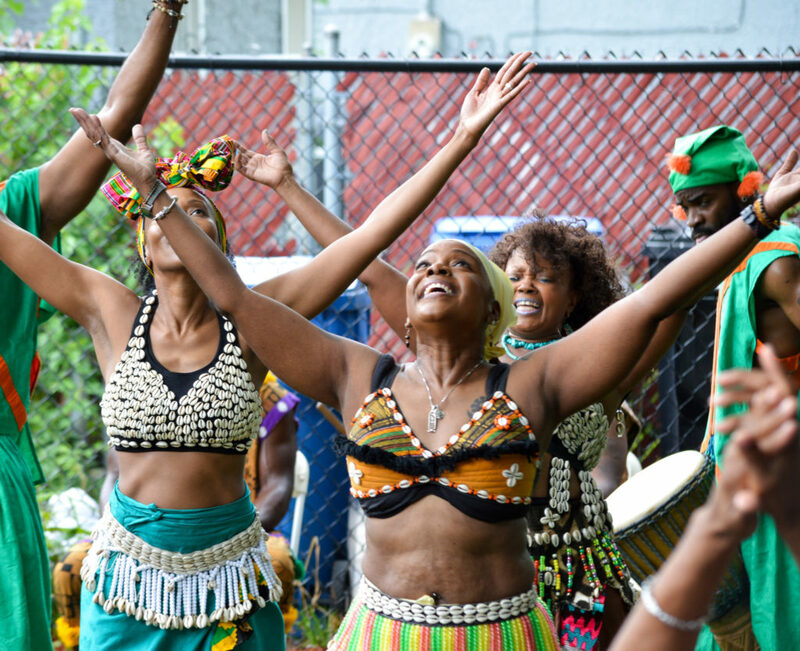 She taught us to clap and snap in time with the drums, and then to sing a Creole chorus: “biyo biyo biyando.” The backyard filled up quickly, and people began to watch from adjacent yards as a woman danced to the beat with her baby. Of the twelve or thirteen babies in the crowd, the only frown to be seen was on the face of a little boy who wanted to move closer to the music. 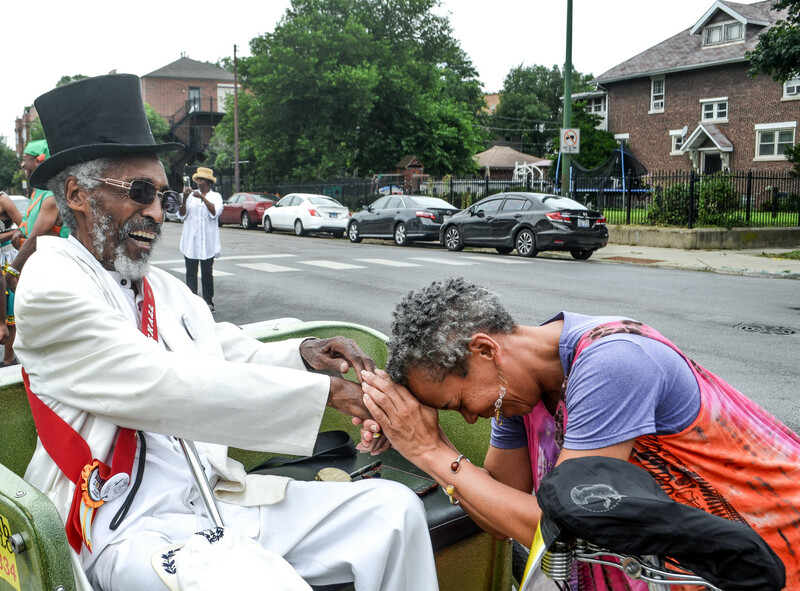 It was a poignant moment—and took place on the same day that a Black barber, Harith “Snoop” Augustus, was killed by a CPD officer on 71st and Chappel Avenue. 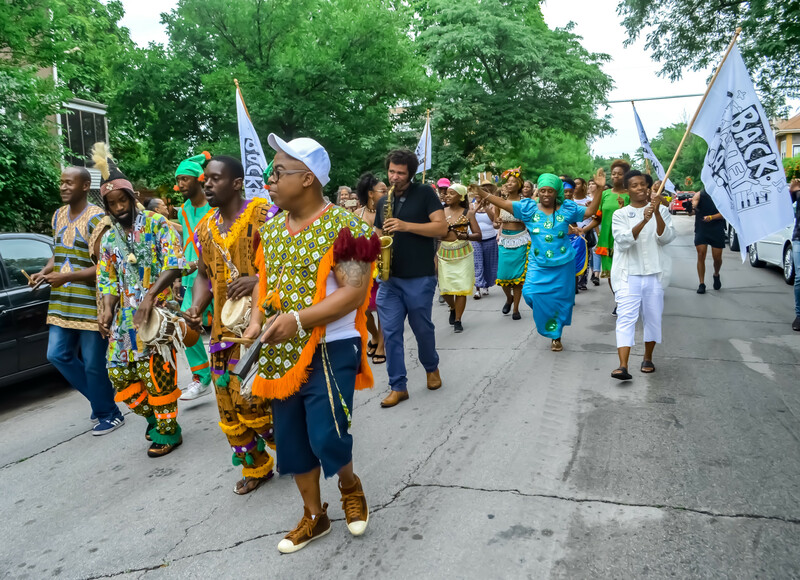 The South Shore community would not know about Augustus’s death until later in the day, but in this moment, it was gathered to mourn the ongoing tragedy of police brutality on the South Side. After the moment of silence, the band picked up again, slower and more solemn than before. The players then worked up, gradually, from a somber tune to a celebratory one. By the time the performance ended, the band was leading the audience in a procession while playing a full and brassy New Orleans melody. The musicians took positions on the front porch at 7337, as the Fly Girls blew bubbles that floated through the crowd and out into the street. Then it was on to the next house. This was only the first half of a day that went on for hours, and where much more happened than can be written here—from a ten-foot-tall “Masquerade” mannequin on stilts and handmade instruments to a triple-decker art installation. 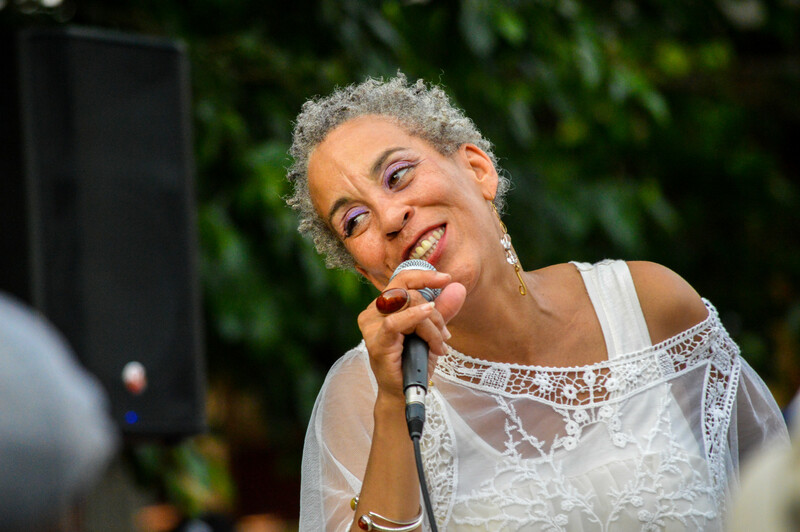 Maggie Brown is a singer of jazz, blues, R&B, and soul. The Tribune calls her “one of the most fiercely committed artists in Chicago.” She has performed with Stevie Wonder, the AACM Inventions Ensemble, Jonathan Butler, and Ramsey Lewis. She is the daughter of Oscar Brown Jr., a Chicago multidisciplinary artist and songwriter, and the sister of Oscar Brown III, also a songwriter and musician. When you say ballads, it’s funny [because] when I used to get gigs, I didn’t know a lot of standards—because I would always be singing my dad’s or my brother’s originals, right? I eventually started to learn standards, like “Don’t go to Strangers” and “You Don’t Know What Love Is,” but for the most part I was blessed to have exposure to this Brown material, so to speak. Well, my set today [is to] emphasize call and response interaction between the audience and the musicians. And yeah, you’re going to hear an Oscar Brown Jr. tune— he put lyrics to a blues kind of jazz song called “DB Blues” by Lester Young. And it just kinda tells the story of how it was when Oscar grew up on the South Side of Chicago and there were a lot of great joints to hear jazz, live. [In] my artist team—including Eric and Reginald—we created a team, and I’m the music part, but one is a visual artist and the other is more of a designer of furniture. So I knew that I wanted my set [to] have a big element of call and response, to be interacting with the audience and require them to respond—but also that we wanted to have things in our yard that would allow for another type of response, maybe written. So that’s why in our yard, there’s places with whiteboards, where you could just take a marker—and please do respond because we want to, for people to contemplate: what is legacy, what is jazz, and what [is] Black joy, images of Black joy. So yeah: I want us to totally interact. The miracle of jazz is that, you know, it’s a spontaneous and creative music and it allows for everybody to just be themselves inside of it. And it still comes out beautiful. RJ Eldridge is a multidisciplinary artist, writer and educator. In 2011, he graduated from the University of South Florida’s graduate program in Africana Studies. A 2017 Kimbilio Fiction Fellow, and his photography, visual and performance work has been exhibited at the Logan Center, the Chicago Art Department, the Hyde Park Art Center, the Arts Incubator, and elsewhere. So, Wilson and Norman Teague invited me to be a part of a group that included myself, Maggie Brown and Eric Hotchkiss. We had meetings over the phone to begin with, and then met in person once we came up with a few of the concepts—but it was a series of brainstorms. I think jazz was obviously one of the jumping-off points, but we wanted to find a series of concepts that could encompass all of the ways in which we wanted to kind of approach this topic: that could include my photographs, Eric’s design and building acumen, and Maggie Brown’s everything, you know, the jazz and the invitation and what she does with the community. The portraits that I chose were of people who represented a kind of contemporary jazz to me. So there’s Calid B., who does afrobeat hip-hop jazz-influenced work. There’s Sam Trump, who is a contemporary jazz and soul singer, artist [and] trumpet player. And there’s Patrick McCoy, who is not a jazz player, but who is a patron of the arts who supports this flourishing kind of South Side Black arts renaissance. Some of the things I wanted to do following those portraits were just continuing to think about the ideas [McCoy] wanted to convey to me, which was thinking about Chicago and the epic scope and the epic register, and producing work that spoke to that long history. One thing that comes to mind when you spend a lot of time making images about the movement that’s occurring here, is that it is concerned with some fundamental things. I guess [it] becomes evident once you produce work that’s in conversation with those fundamental things: what does it mean to be a citizen? What does it mean to be a human being? What does it mean to fight for your rights? What does it mean to stand in the face of challenges? What does it mean to build, you know, when you’re in that? And I think that all of these images also speak in that register. 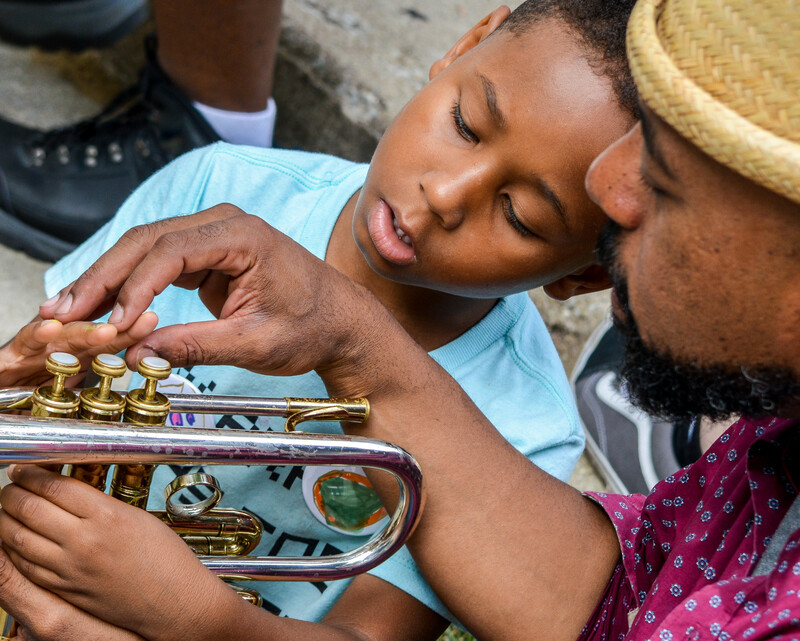 The festival is a revival of a practice that started on the South Side, when it just came down to wanting people [to come together]. When people just came, I should say it started because people were seeking a way to celebrate and enjoy and bring the community together. And I think that that is something that’s eternal. It’s like a heartbeat of a city or of a space. Jimmy Ellis is a saxophonist who has been playing in Chicago and elsewhere since the 1940’s. His first album as bandleader, “The Jimmy Ellis Quartet Live at Andy’s Jazz Club in Chicago,” was released in 2016. He turned eighty-eight this year. Who’s gonna tell a story, me? I don’t know, a particular story—there’s a lot of stories. I’ll tell you one thing, I’m happy to be here. And I think what they’re doing here today started back in the fifties, when I was a youngster—where I grew up on 49th and Champlain, in the alley. That’s where the jazz started, in the alley, and it kept on through the years and flourished like this in other places. Because music is the key to life, and everybody’s having a good time. That’s the beauty of it. We’re having fun. No violence. All beautiful. Of all the bandleaders that you’ve played with over the years, who do you think was the best one? Who was your favorite to play with? No favorite. My brother Morris Ellis, he’s a great leader, as a musician. But I’ve played with so many great people. I’ve played with Earl ‘Fatha’ Hines, I played with Duke Ellington one job…. I worked with so many great musicians, you know, I can’t name them. I try not to because I might miss somebody. I know you just cut your first record as a band leader, it was a live album. Was there a reason you wanted to do it live or did it just happen that way? It happened that way. My wife kept on bugging me, saying I should record something, because I never was that interested in recording. And not that I didn’t like it, it’s just that I was doing other things, but a couple of years ago she said, ‘you ought gonna do something.’ I have a birthday coming next Wednesday, I’ll be eighty-eight, and I thought I better record something, so I did it a couple of years ago, I recorded a CD, “Live at Andy’s Jazz Club.” You know where that is? In Chicago, it’s on Hubbard. I forget the exact address. So I made it live there at Andy’s, and I played with some of the greatest musicians in the world: you know, Sammy Davis Jr. I don’t like to name people, but [it was] a lot of great people. When I finished high school, I had a scholarship to Florida A&M, but I was already working as a musician in Chicago and I thought—well, I’ll just go to school here and keep on playing, because I was working as a professional right away. By 1948 I was already playing. So I just thought I’d make that my career. But the good part about it is that you’d be surprised [by] the impact that music has on your life—not just for use, for life. I like to cook. I haven’t been up to it lately, but cooking is just like jazz. It’s creative, you know, you can create meals and create food, combinations of things, you know. That’s what jazz is all about. That’s American music, and we should be grateful and thankful for it. I mean, we don’t really appreciate it like we should in this country. I’m sorry about that, but that’s a fact. Where I grew up on 49th and and Champlain, back in the day, if I’m eighty-eight years old, you can just imagine how much love there was back in the day. Didn’t have none of this violence, people knocking down the old folks, all kinds of dumb stuff. This man got shot last night, walking his dog. Man is eighty-eight years old or something. These gangbangers shooting at somebody else, and shot the man in the back. You know, it hurts me because… it hurts me that this is still going on, because it wasn’t happening when I was a child. It wasn’t thought of. You had respect for your elders, you know, but today it’s a different kind of world. Bridget Vaughn is a producer for South Side Weekly Radio and a photographer for the Weekly. She last covered the Bud Billiken Parade and interviewed jazz singer Tracye Eileen. Kyle Oleksiuk is a contributor to the Weekly and student at the University of Chicago. He last wrote for the Weekly in May about jazz saxophonist Steve Coleman. Enjoyed reading this…..will share article with my son -in-law…. his father is in his late eighties,losing his eyesight but he must make periodic pilgrimages to the area with him. His dad, Freddie Cole and family go that far back. I would love to talk to him about these icons, and black traditions. This event took place in the neighborhood where I grew up in the 50s and 60s, and it was so wonderful to come back and see it looking so beautiful and seeing all the creativity. All the performances were great, but Maggie Brown was really something else! I hope they do it again!